A former backup singer for .38 Special, Dale Krantz-Rossington became known throughout the music community as a gritty, Joplinesque vocalist whose commanding stage presence could mesmerize a crowd. It was this reputation that garnered her the coveted role of lead vocalist for the Rossington-Collins Band. With four albums under her belt, as lead vocalist for the Rossington-Collins Band and the Rossington Band, she secured a place for herself in rock and roll history. Now, along with husband Gary Rossington, she performs with Lynyrd Skynyrd as a backup vocalist and contributing songwriter. Not to be deterred, Gary and Dale formed a new group, simply called the Rossington Band. With a new sound, Returned to the Scene of the Crime was released in 1986. 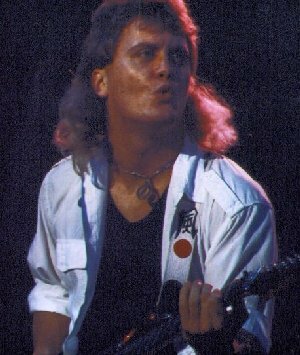 The following year, Gary and Dale joined the remaining survivors, along with vocalist Johnny Van Zant and guitarist Randall Hall, for the successful Lynyrd Skynyrd Tribute Tour. Although the Rossington Band released a second album in 1988, Love Your Man , their hearts were with Lynyrd Skynyrd, where they remain today. Jay Johnson is a native of Muscle Shoals, Alabama, and is a long-time veteran of the Southern music scene. 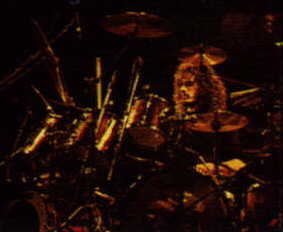 He played on his first studio session in 1982, while still in high school. He went on to play on various sessions, albums and demos, including New York rocker Moody Phillips, Mickey Newbury, and Randy Cutlip (former keyboardist with THREE DOG NIGHT), before striking out on his own in the popular southern band RADIO TOKYO. The band played widely in the Southeast, booking with Southeastern Attractions and CAI Entertainment. 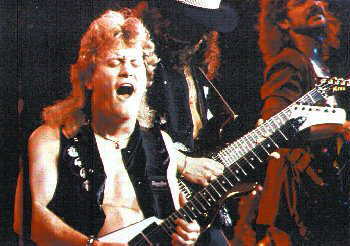 The extensive live experience, coupled with his prior studio work earned him a spot in the ROSSINGTON BAND, with Lynyrd Skynyrd guitarist Gary Rossington and singer Dale Krantz-Rossington. The band recorded two albums at Muscle Shoals Sound Studio, both produced by Johnson's father, recording engineer and guitarist Jimmy Johnson of Aretha Franklin & Bob Seger fame. The first album, "Returned to the Scene of the Crime", was released on Atlantic Records. 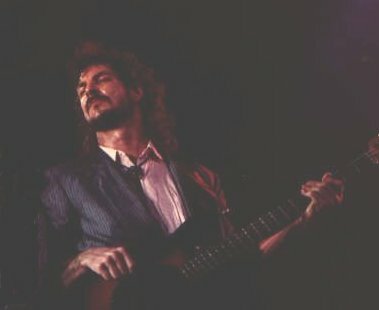 In support of the disc, the band headlined a club tour along the Pacific Coast and back through Colorado and Texas, as well as performing with MCA recording artist KANSAS on the "Power" tour in summer 1987. 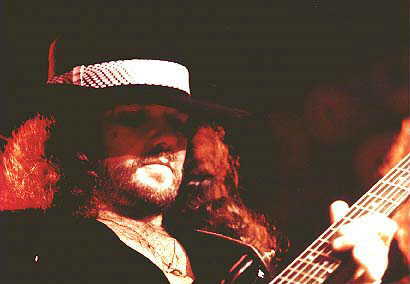 After spending two years with the likes of guitar virtuosos Rossington and Steve Morse, Johnson returned to Radio Tokyo with plans of achieving a similar success. The Radio Tokyo band released its first cd in 1993, entitled "Songscape". The first single, "Losing You" was a regional hit in the Southeastern US at the time, and the band maintained an extensive touring schedule that carried them from Alabama and Georgia to Maryland, Virginia, Ohio, Michigan, Pennsylvania and New York. Radio Tokyo toured with such acts as Derek St. Holmes (former Ted Nugent guitarist), A Flock Of Seagulls, Wet Willie and Derek Trucks . THE SOUTHERN ROCK ALLSTARS. The Allstars lineup includes the cream of the Southern Rock crop: Johnson on lead guitar, Dave Hlubek (Molly Hatchet) also on lead guitar, Jakson Spires (Blackfoot) on drums, and Greg T. Walker (Blackfoot & Lynyrd Skynyrd) on bass. Growing up in Jacksonville, Fl in a family of 12 children was no easy task for Tim. Not only were the summers extremely humid but the musical climate was " white hot." Tim was playing live at the age of 12, singing and writing his own material. With over 20 years of extensive musical experience, Tim has played with such performers as Jerry Lee Lewis, John Anderson, Carl Perkins and The Righteous Brothers to name a few. Tim joined "Rossington" in 1985 for the release of "Returned to the Scene of the Crime." Then as Bassist-Songwriter for "The Rossington Band" , opening for "Kansas" and finally for "The Lynyrd Skynyrd Tribute Tour." Ronnie Eades joined the group in 1987 bringing a distinctive,soulful saxophone style which has been recorded and heard around the world. Co-Founder of the Muscle Shoals Horn Section in 1967-68, Ronnie had recorded and performed with over 400 artists by 1981. These included such legendary talents as Elvis Presley, Aretha Franklin,Percy Sledge,Wilson Pickett , The Oak Ridge Boys, Candy Staton, The Osmonds, Bob Dillion, Elton John, Paul McCartney, Rod Steward, Barbara Mandrell, and Dolly Pardon.Ronnie recalls a time when The Muscle Shoals Horns were being heard on 5 hit records at the same time.Currently Ronnie is in full-time ministry with Christ Gospel Churches International . He is heading up the Recording and Sound Department. For Tim,growing up in the musically magical , inspiring atmosphere of Muscle Shoals, AL was the ultimate creative school-yard. He started opening for the legendary Buford Puser(Walking Tall)at the age of 13. At 15 , Tim signed an Artist/Writer contract with Music Mill Recording Studio and started playing sessions and co-writing with some of the best writers in the business. 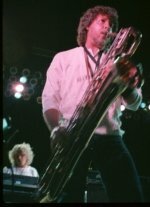 After years of touring, showclubs and cruise ships,Tim joined The Rossington Band in 1987. With an amused look, Tim states "I still remember Dale saying "Welcome to Rock and Roll!" Boy, I really knew what She meant later! Playing with Gary was one of the greatest, wildest and truly life-changing things that ever happened to me!" 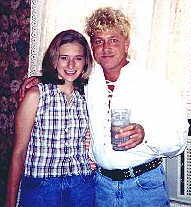 Tim ( pictured here with daughter, Jessica ) presently is writing, publishing, producing and still letting His fingers do the walking! In the last five years Mitch has been involved in freelance work. He did a track for Luke Walker at Muscle Shoals Sound called "Back to Normal", produced by Roger Hawkins (famed MSS Rhythm Section Drummer). He recently recorded, with Bob Cain, an album called "A Tribute to Bill Gaither". Recorded at PolyMusic in Birmingham, the album features Bob's soulful vocals and skilled trumpet combined with the refreshing and uniquely styled arrangements of pianist Mike Dulin. An upcoming compilation album (so far untitled) will contain unsigned south eastern bands. John Onder, the producer and former bassist for Shrapnel Records artist Joey Taffolia, will be featured. John and Mitch have been playing together for the last 7 years. Definitely a drummer's dream! The two friends conducted a number of bass/drum clinics last year. 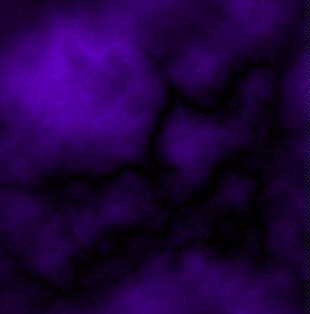 Mitch is currently compiling video to put out instructional video tapes as well as a CD-ROM version. Mitch plays primarily in Huntsville or Birmingham these days. The primary band has been the Edd Jones Orchestra which performs mostly at The Club, in Birmingham. It has been a mainstay for dance bands since the forties and is one of the few dining rooms in the U.S. that has an orchestra six nights a week. Most of the gigs are stylized, meaning big band, swing, jazz, or dance band. There are a number of these type bands that come down from the North that play the casinos, riverboats, and landmark hotels. 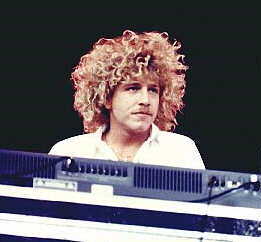 A few of the bands Mitch has played with include Guy Lombardo, Sammy Kaye, Jan Garber, and Don Glaisser. He still plays a number of rock gigs and has been teaching privately since ending the Tribute Tour in '88. Mitch's "Day Time Job" is working on NASA's Space Lab Project. He has a B.S. degree in computer science and math. He writes, tests, and maintains software designed to collect data from experiments that fly aboard the Space Shuttle. Mitch says; "It's a wonderful job and so cool!" He considers himself to be VERY lucky. As he puts it; "To play with legends such as Gary and Dale, have Artimus Pyle standing beside me playing tambourine or cowbell, to gain great friends from Lynyrd Skynyrd and hear their stories, to have learned so much about playing real music with real musicians who are real people - it has been a dream come true. I thank Skynyrd for all they have done for me and for their fans."